Quambone Mentioned in Current Accounts July 1959. The branch was opened in a rented weatherboard residence in the very small main street without any security of tenure. The premises have always been on the same site. I understand that the late John Roxburgh picked out from the passing train that Quandialla was suitable for a branch (April 1922): It was his "baby" and I was grateful for the help he gave me. The township on the Forbes-Stockinbingal railway line, consisted of a general store, a mixed business, an Estate agent, a baker, a blacksmith, and a tiny butcher's shop, as well as a public hall, a public school and some 30 or 40 residences. The agent also conducted an unofficial Post Office, but although the train passed each day it was very many months before the Postal Department could be persuaded to send mail on the train. Instead we had a tri-weekly mail which went to Grenfell by train, thence by horse-drawn vehicle to Bimbi, where the mailman remained overnight, and delivered the mail to Quandialla some time next day, depending on the condition of the road. When bank notes were required, it generally meant we had to go to Bimbi (8 miles) to collect late in the afternoon to have the notes for the next mornings' cash requirements. For a start business was very slow due mainly to lack of confidence of residents who mostly were of the opinion that there would not be enough business to warrant the bank staying. 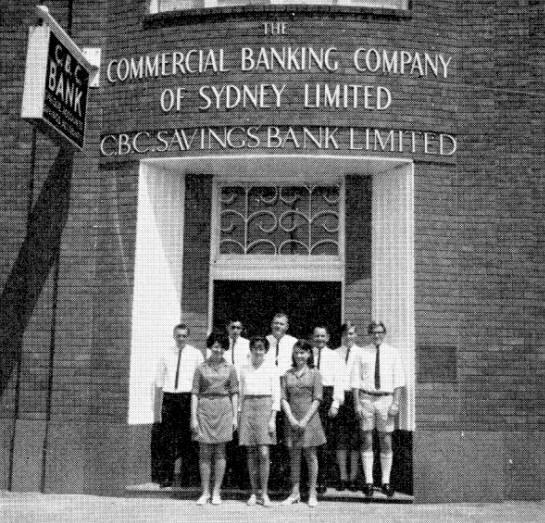 And indeed, incredible as it may seem, many were hard to convince that it really was a branch of one of the major banks operating in N.S.W. Most local people banked at the Wales. This early lack of confidence was against securing anyone to build premise for the bank to rent. 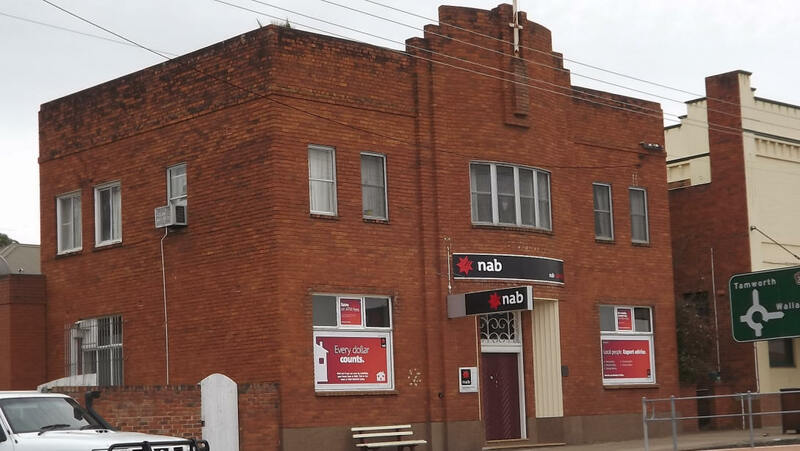 With the urgency of retaining premises, the bank had no option but to buy the premises it was temporarily in possession of. As business progressed - and it really did progress very well - the premises were enlarged and remodelled on at least two occasions, making the still weatherboard premises rather expensive. The branch had not been opened very long when there were requests from Bribbaree and Caragabal to open agencies in those places which we did. Both were conducted bi-weekly by the manager or his assistant, at first by horse-drawn vehicle, both places being about 13 or 14 miles away by road. Later the manager bought a "tin Liz" car, the T model form was the only car one could be reasonably sure of with the roads as they were in wet winter months, being unmade on black soil. For a brief period when roads were impassable in a car, the local fettler, Mr. Bill Dougal, kindly lent his railway trike to run the Bribbaree agency, but the bank stopped this when the news reached Sydney, it being the opinion of Head Office that such a method of transporting cash was far too dangerous. strongroom) "108 degrees in this office working until midnight". On returning from holidays - I think Clive Ashdown relieved me - I saw written underneath "110 degrees in this office too b.... hot to work". 1922 May 16 Branch opened by Mr B.O.Tarlinton from Head Office. 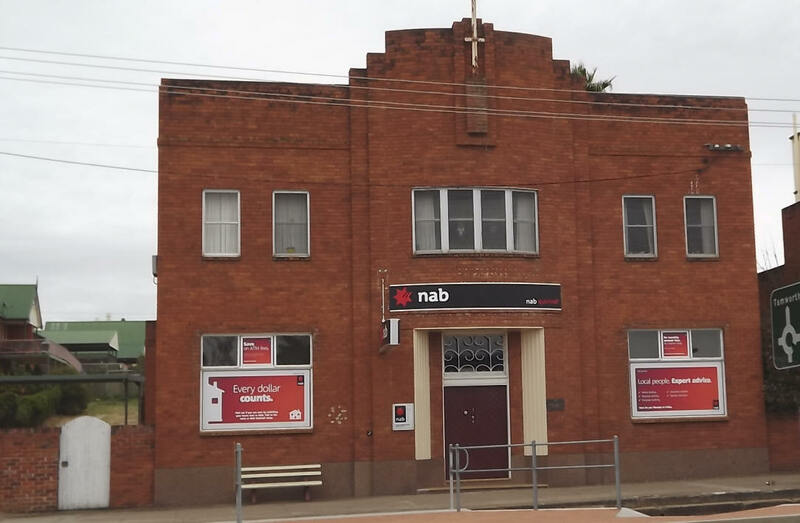 Branch was originally located in rented premises and in 1922 the land it was on, Second Street, Quandialla, was purchased and a new building erected at a cost of 1,275 pounds. 1957 photos by Jim Skinner. Branch is behind store on right. 1972 May 8 Quandialla Branch was converted to a Receiving Office from Grenfell branch. 1977 listed in Annual Report as receiving office of Grenfell. 2007 September photo from David James' daughter Christine who says "There's not much else there!" 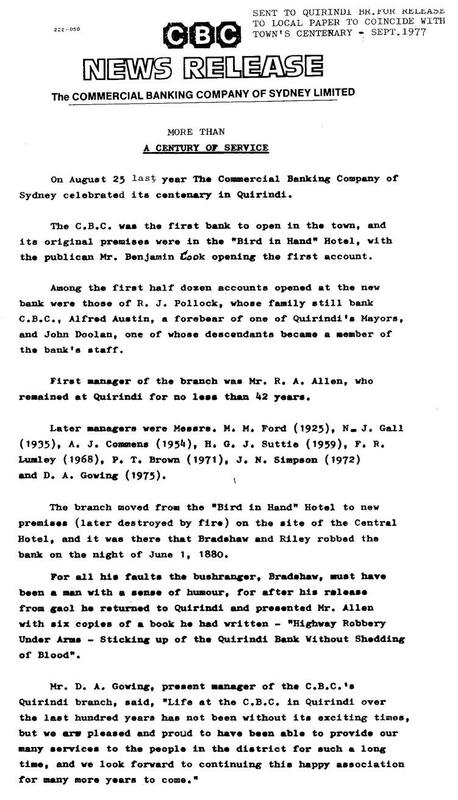 2008 December David Jobson attached an interesting story from the first manager of the branch, Mr H.R.Robinson who related it to someone in October 1961. It was tough being a bank manager in those days, well a country one anyway! 2009 February Philip Reed provided this anecdote: I was the 2nd Officer, Marion Troy the ledger keeper at the time of closing be it 5th May 1972 at 5pm. We transferred the cash etc to Grenfell on the Saturday 6th May 1972. This was quite an experience; one of the things I remember happening prior to the closing was everything at this point being handled confidentially as really no one knew in town that the Bank was closing. The local Postmaster had an appointment in the usual course of business with Lyle Kerr the Manager as he wanted to open up some type of other business in the town and was looking around the town to buy commercial premises which he required assistance for. 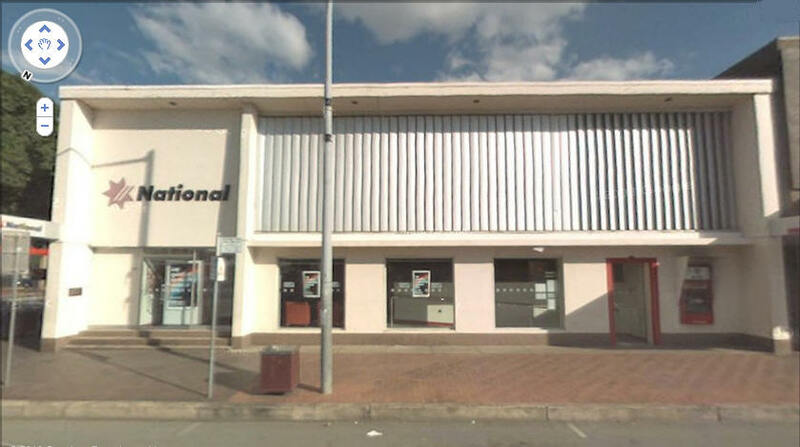 Before the end of the appointment Lyle had sold him the Bank building. This particular chap years latter mentioned 'not too many go to the bank for a loan and actually by buy the Bank'. 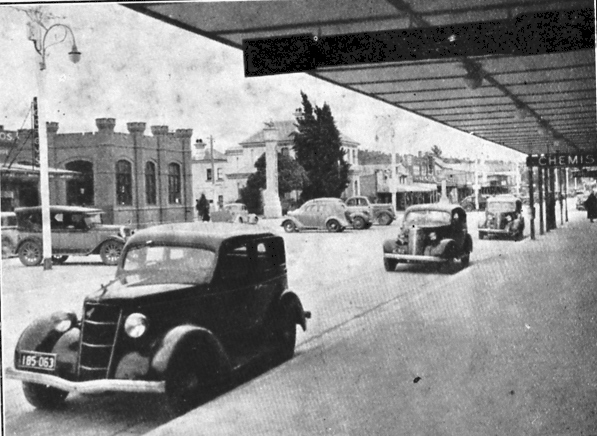 1938 reproduction of a photograph Frank Maundrell came across of Queanbeyan taken around 1938. 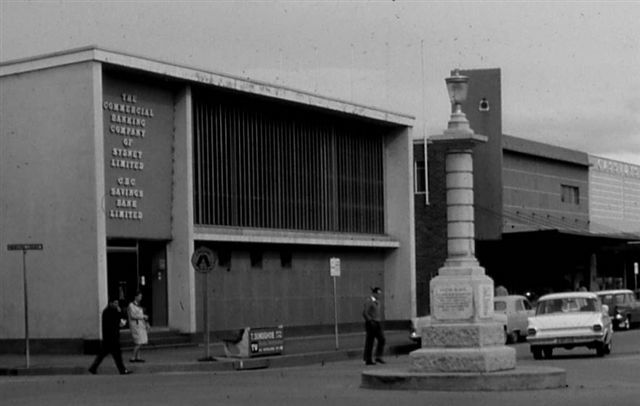 It appears in a publication called The Story of Queanbeyan 1838 - 1938, published to commemorate the Town's Centenary. Frank says: It was part of his father's collection. 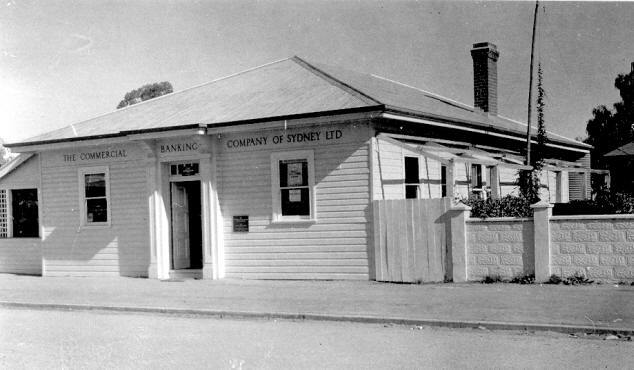 The photograph is captioned Bank of New South Wales and Commercial Bank of Sydney in Monaro Street. Unfortunately, the old CBC is obscured by a tree. However, I thought it might be of interest as it is a depiction of the old building, prior to the one on the website. 1963 photo by Kevin Greenaway. 1876 August 25 branch opened. 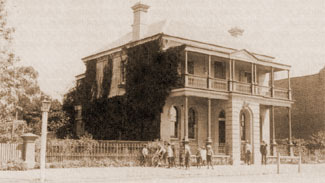 1888 Original premises erected. 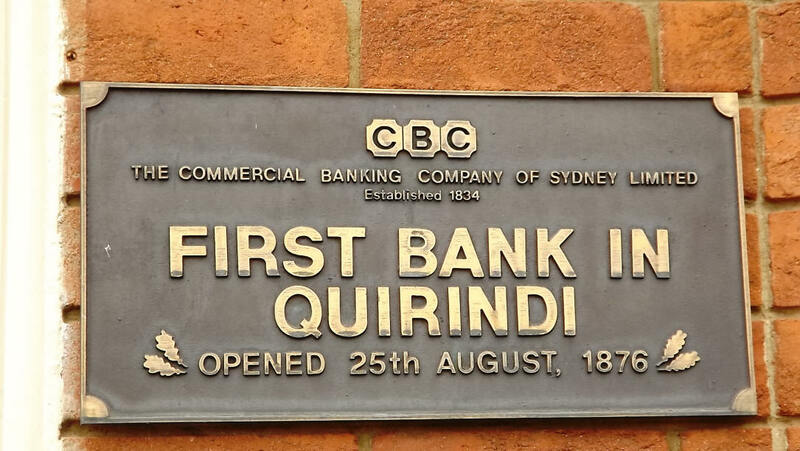 It was the first bank in the town. 1893 AJSB Quirindi closed following depression. 1969 B&W photo from Current Accounts July 1969. 1978 David Jobson says "I took this picture on a ride up there in 1978 and that's my BMW out front." 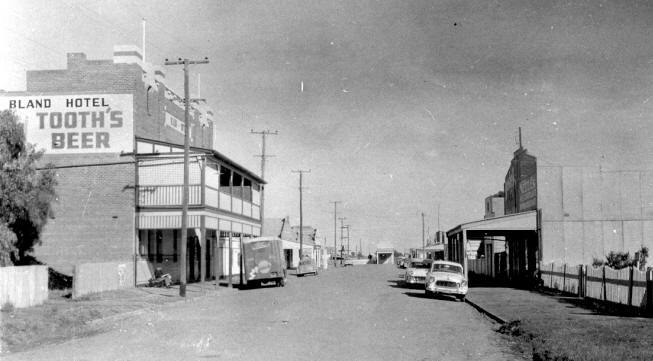 Quirindi was where I started as a junior junior in January 1958. L.C.P (Les) Turner was the "senior" junior, The manager was Alec Commens, the accountant was Shearer Watt and the teller was Nev Hillenberg! 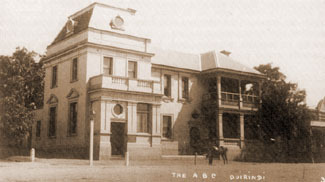 2010 December John Beer sourced photos of the original CBC in 1889 and Joint Stock 1910 branches from www.upperhunter.org.au. 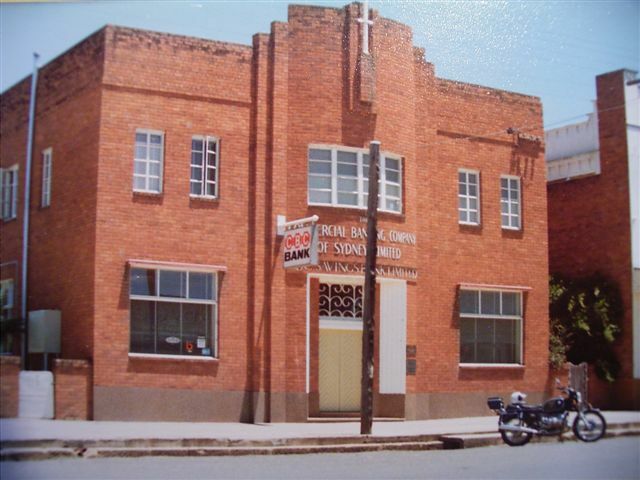 2013 June Frank Maundrell provided three updated photos of Quirindi branch and the plaque on the building.